Republic of Ireland pulled off one of the upsets of the Euro 2016 qualifiers beating current World champions Germany 1-0. Northern Ireland put in a commanding performance to beat Greece 3-1 and book their place at next year’s Euro championships in France. Meanwhile, Scotland crashed out of the tournament after they were held to a 2-2 draw by Poland. The race to qualify for the Euro championships intensified on matchday 9. Groups D, F and I were in action with a total of 16 nations in the fray. Portugal pulled off a 1-0 victory over Denmark and thereby ensured their ticket to the Euro 2016 joining Northern Ireland as the two nations to secure qualification on matchday 9. In other results, Hungary beat Faroe Islands 2-1, Georgia hammered minnows Gibraltar 4-0, Finland were left frustrated as they were held to a 1-1 draw by Romania. The Albanians were overrun by Serbia 2-0 in a fiercely contested match. Republic of Ireland produced a stunning victory over world champions Germany in Dublin to leave automatic qualification for Euro 2016 in their own hands. Substitute Shane Long's sublime 70th-minute finish from a long kick by keeper Darren Randolph, on for injured Shay Given, secured a memorable win. Joachim Low's side dominated possession but could not find the net. Jerome Boateng headed over before Ilkay Gundogan, Andre Schurrle and Thomas Muller wasted chances. The most important win of Martin O'Neill's two-year reign means the Republic will qualify for Euro 2016 if they defeat Poland in Warsaw on Sunday. They are already guaranteed at least a play-off place. Scotland's hopes of reaching Euro 2016 ended as Poland equalised with the final kick of the match at Hampden. Robert Lewandowski scrambled the ball over the line as the hosts failed to clear a stoppage-time free kick. It had appeared Scotland's faint hopes of qualification were still alive as superb goals by Matt Ritchie and Steven Fletcher put them in front. But Lewandowski, who had silenced the home crowd with an early opener, repeated that feat in the last seconds. Northern Ireland have qualified for the Euro 2016 finals by beating Greece 3-1 on a brilliant night at Windsor Park. 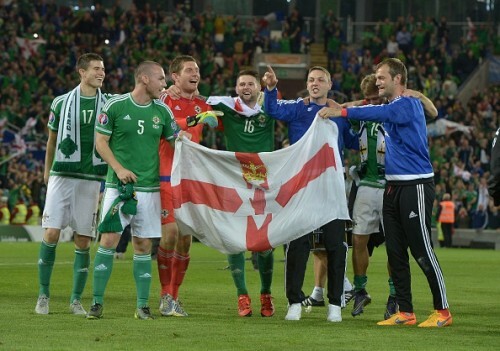 Two goals by skipper Steven Davis and one by stand-in striker Josh Magennis sent them through to a major tournament for the first time in 30 years. Davis forced in a first-half goal, and then headers by Magennis and Davis ensured Northern Ireland were going to their first European finals. Christos Aravidis got a late goal for Greece, but it did not spoil the party. With Romania drawing 1-1 at home to Finland, Northern Ireland will top Group F if they get a point in Finland on Sunday in their final qualifier. Portugal have qualified for Euro 2016 after a Joao Moutinho goal was enough to beat Denmark. The Group I winners could be joined by the second-placed Danes or third-placed Albania, who are a point behind them. Albania missed the chance to qualify when they lost 2-0 at home to Serbia on Thursday, almost one year after the reverse fixture was abandoned. However, a win over bottom team Armenia on Sunday will be enough as Denmark have played all their games.